After a dozen years, the Democrats own congress. 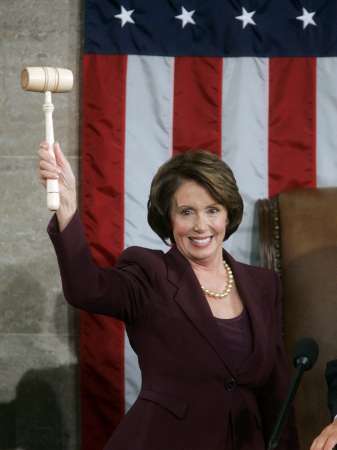 Nancy Pelosi is the first woman Speaker of the House in the 215-year history of the United States Congress. She is also the first Italian-American to hold the post. It is a cultural phenomenon, a political revolution of sorts. And none of it happens without the will of the people. Well, the will of the people, a shitload of corruption, a lousy president, and one whiz-bang of a bungled post-war effort. The celebration is over. The thud you hear is the high of November victory plummeting into January reality; a rough trip, even for hardened street fighters like Pelosi and her gang. They struggled long and hard for this, pitched a lot of dubious promises, and now say the right things about the first 100 days of power, and Social Security, and Minimum Wage, and National Health Care, and blah blah blah. Great. Fine. Have a ball. Know this: The American people, Republicans, Democrats, Independents, casual observers, catatonics at Bellevue Hospital in New York, are extremely unhappy about the goings on in Iraq. Peeved, you might say. Fed up is more to the point. This is the main reason why they lined-up at the polls in record numbers for a Mid-Term Election. Don’t be fooled by America all of a sudden getting the Liberal Bug or queasy on God and hyped about Gays or jazzed about tax hikes. And most of these angered hoards couldn’t be bothered to raise an eyebrow about bi-partisan warm and fuzzies either. Here’s what the American people said on November 7, 2006: We want answers. Concrete action. What’s going to be done about this military mess? What is the plan? Where are the answers? Timetable? Movement? Change? Accountability? Functionality? And the American people will get their answers one way or the other. Because now their president is standing tough with talk of increasing troops, giving it one last shot to make good on this high-stakes gamble of his: One last ride on the rodeo for the Faux Texan and his wounded hawks. Defiant. Purposeful. The question remains: What does the Congress do as the new Voice of the American People, the only true and binding dissent to this seemingly bottomless abyss? The talking is over. The debate and speeches and rip-roaring fury are but a memory. Now it’s time to take the blabber and prognostication and get into the action. Will we see the president ask this new Congress, this new Democrat-controlled Congress, for increased funds for this last ditch surge? 20,000 strong. Fuel for the fire. You betcha, sonny. Will it have the collective balls to deny the troops? Will it have the fortitude, the “political capital”, to steal a goofy phrase, that it takes to say NO. Not “first voting for before voting against” nonsense – but NO. Will this one-third body of our blessed Checks and Balance system do some checking and balancing, or will it carry the water for the 2008 Presidential Campaign their Mother Hen, Hillary Rodham is currently running. Politics as usual? Power play over enacting history? Words over truth? Ah, to be the outsider throwing stones now holding the locks to the glass doors. Cindy Sheehan is not going away. Thank the Lord. Any time someone is painted as a nut by those in charge or as a mere curiosity by the mainstream media there is a good chance that there’s some serious embers there. Not the kind of smoke you usually get from groaning celebrities or vapid pundits, but the kind of protest that sticks. Pissed. Moaning. Motivated. Real. As real as a mother of a dead son gets. And that’s plenty real, mista. Now the Democrats are in the firing line. More so than the president. Everyone knows the president is not backing down, nor should he. He’s president, after all. Commander-in-Chief. Head Honcho. Congress gave him the latitude to run amok, and amok he has run. His fingerprints are all over this bloodbath. And while things continue to spiral into further chaos he is not going to let it go, not unless he gets the outcome he bargained for. The only barricade to this madness is Congress now. The Congress the American People put in there – the Democrat-led Congress. If these elected officials, our employees, our representatives, fail to stand tall against this president, or a segment of them fail to do it, and not with talk but votes, I will print their names here, and I would urge my readers who agree with the concept of their government speaking for its majority to write and call and harass the culprits. If Congress does enact the people’s will (its basic purpose and design) then it will force George W. Bush to an impasse equal to Lyndon B. Johnson in Viet Nam. Finally, after years of trumped-up comparisons, Bush’s Iraq will truly enter the realm of Johnson’s greatest folly and forever cement this president’s legacy as an unrepentant warmonger. It’s over. There is nothing to be gained by escalating the fighting. The time to properly conduct this campaign was three years ago. We failed to finish the job. The only reason to send the young to die now is to save the face of a fractured presidency and the marred reputation of a nation. Not good enough, bub. Not now. Not ever. So now it’s time for the loyal opposition to spread its wings and take flight. Either that or become another useless gaggle of windbags warming seats until the next steaming pile of feces tap-dances its way into our hearts. What’s it gonna be, folks? What’s it gonna be, Nancy?